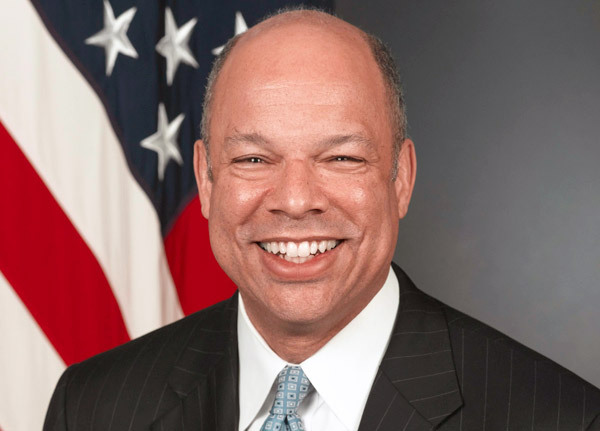 Jeh Charles Johnson was sworn in on December 23, 2013 as the fourth Secretary of Homeland Security. Prior to leading the Department of Homeland Security, Secretary Johnson served as General Counsel for the Defense Department, where he was part of the senior management team and led the more than 10,000 military and civilian lawyers. As General Counsel of the Defense Department, Secretary Johnson oversaw the development of the legal aspects of many of the nation’s counterterrorism policies, spearheaded reforms to the military commissions system at Guantanamo Bay in 2009, and co-authored the 250-page report that paved the way for the repeal of “Don’t Ask, Don’t Tell” in 2010. Secretary Johnson’s career has included extensive service in national security, law enforcement and as an attorney in private corporate law practice. Secretary Johnson was General Counsel of the Department of the Air Force from 1998 to 2001, and he served as an Assistant U.S. Attorney for the Southern District of New York from 1989 to 1991.